This week I will be talking about the New River Gorge Bridge in West Virginia. It will be a stopping point for our roadtrip which will be taking place next week. 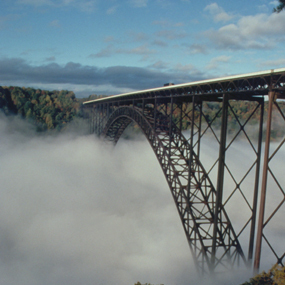 The New River Gorge Bridge was completed in 1977, 3 years after construction started in 1974. Its purpose was to reduce a 40 minute mountain road drive to just under one minute. It is the longest steel span bridge, at 3,030 ft, in the western hemisphere and the third highest in the United States at 876 ft (behind the Royal Gorge Bridge at 955 ft and Mike O'Callaghan - Pat Tillman Memorial Bridge at 890 ft). During Bridge Day, which is the third Saturday of October, the bridge is open to pedestrians and there are a lot of festivities with food and crafts vendors, BASE jumping, rappelling, music and more. On Bridge Day, it is West Virginia's largest one-day festival and is the largest extreme sports event in the world.